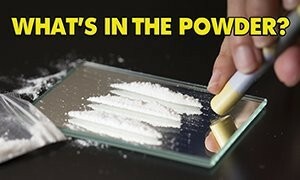 You are here: Home / What We Do / Campaigns / What’s in the Powder? The What’s in the Powder campaign is a collaboration of the Ana Liffey Drug Project and three Students’ Unions from DIT, TCD and UCD. The campaign was launched on 1st April 2016 by the Lord Mayor of Dublin, Críona Ní Dhálaigh, at an event in the Mansion House. HIV Ireland supports the campaign’s harm reduction approach with key messages that aim to reduce the harms associated with the choices that people may make about using powders and other drugs. Harm reduction information and education is essential to provide people with options that help to minimise risks associated with drug use and to help keep people healthy and safe. The campaign builds on the success of the partnership achieved with the recent ‘What’s in the Pill?‘ campaign – now supported by 15 third level institutes and the Union of Students in Ireland. Organisations can support the campaign by sending an email to info@drugs.ie and request a customised factsheet and poster (free of charge). More information on the campaign can be viewed at www.drugs.ie/whatsinthepowder, where posters and factsheets can also be downloaded. Download the HIV Ireland Poster. Download the HIV Ireland Factsheet.